Two of the UK’s leading innovative defence-focused SMEs, 2iC and Blue Bear Systems Research, are collaborating to develop a comprehensive autonomous last mile resupply capability which will enable unmanned vehicles to be part of the Whole Force Approach. 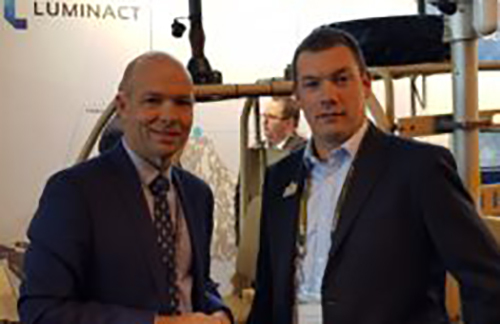 By joining 2iC’s plug and play integration capability across networks and systems with Blue Bear’s approach to plug and play for unmanned vehicle control, the partnership plans to deliver truly game changing capability to MoD, international allies and the wider civil sector. The solution uses two major components, the Autonomous Vehicle Service (UVS), lead by 2iC, to coordinate between all systems and users, and the Unmanned Vehicle Environment (UVE), lead by Blue Bear, which provides autonomous vehicles and their coordination performing the re-supply tasks in the last mile. The Autonomous Vehicle Service is a software solution that runs on standard battlefield computers, such as handheld Android devices, laptops and embedded computers. A Generic Soldier Architecture (GSA) compliant vest will used to demonstrate that it can run AVS, as well as any command application that provides the graphical front end. AVS uses 2iC’s Lean Services software to provide a common interface for; the soldiers in the last mile, frontline commanders, commanders further back, the Unmanned Vehicle Environment, any systems that feed into improved operations (including logistics, meteorology, etc.) and provide full, live feedback reporting of last mile status. AVS will provide logistics services to the last mile forces; ordering, provisioning, planning, battlefield status updates, and feedback about re-supply progress. To achieve this, it will interface between the Blue Bear UVE to minimise unnecessary human interactions and achieve maximum autonomy. The solution allows a human-in-the-loop when required and be changed as circumstances dictate, for example, as supplies become scarce and a human must make priority decisions. The Unmanned Vehicle Environment generates auto-planned delivery and exit routes for unmanned vehicle systems based on battlefield status. UVE will take a re-supply request from UVS and allocate the appropriate unmanned assets to the task. This could be a single asset or swarms of multiple assets. The project will initially focus on unmanned air assets but will later incorporate unmanned ground systems as well. The Blue Bear Mission Management & Asset Planning system (MMAP) will carry out all the vehicle allocation and high level mission planning, whilst their Ground Control Station (GCS) will take care of all the autonomous vehicle routing such as terrain analysis, re-routing, vehicle communications and dynamic re-tasking. The combined systems will output updates back into the AVS to allow updates to the individual soldier, commander and any other system, such as higher level logistics planning. The GCS and MMAP will ultimately be agnostic of the type of delivery vehicle, while aware of their different characteristics. For the UAVs, Blue Bear will demonstrate significant autonomy prototype enhancements to their onboard software which will demonstrate the UAVs ability to organise and re-organise supply deliveries amongst themselves in the event of broken communication links. This will show continued operation in challenged environments. AVS will also provide the UVE with the latest information which can affect routing, such as the ground and air situation, meteorological reports, etc. from other battlefield systems. The solution will demonstrate a change in the ground situation that requires re-routing of re-supplies to occur. While this project demonstrates a solider re-supply scenario, the technology could be applied to a vast range of use cases. This project synergistically combines the capabilities and intellectual property of 2iC and Blue Bear removing the much of the risk, time, cost and pain of what would normally be considered a technically challenging set of interoperability and integration tasks. The partnership will deliver revolutionary autonomous solutions for the last mile, bridging ground and air, forces near and far, and other battlefield systems, whether tactical, operational and strategic; both UK and coalition.